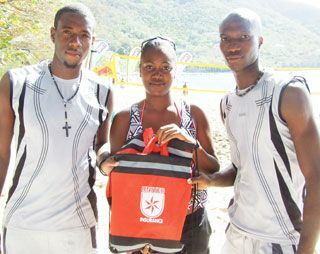 Into its second year, the volleyball action attracted six male and six female pairs, including representation from the visiting D-Aces volleyball outfit from Barbados. In the end though, it was the Vincentians who dominated the competition. The male division was secured by the duo of Kemaul Lee and Atkins Questelles, who ousted Brian Burke and Cassius Franklyn 15-12 in a one setter final, as the organisers raced against time. Cleuvann Cumberbatch and Jamal Small, another Vincentian pair took the third spot. Among the females, the experienced combination of Nikita Campbell and Ladonna Woodley dismissed Bretisha Gregg and Andeen Spring 15-6, as both pairs went after the title. Chairman of the Bequia Shore Activities Committee Junior Sutton told SEARCHLIGHT that he welcomed the interest shown in the volleyball and thanked the beach volleyball commission of the St Vincent and the Grenadines Volleyball Association for their input in adding some greater interest to the event. In last year’s inaugural competition, it was four-a-side affair, and Sutton said he foresees beach volleyball catching on as time goes by. Sutton said he was grateful to Red Bull, First Citizens Investments, United Insurance and Intimate Selections for providing the winners with tokens.